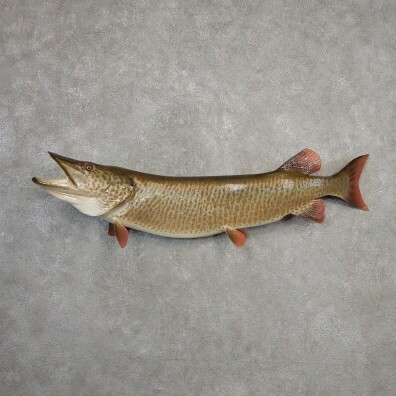 This is a fantastic reproduction Muskie taxidermy fish mount, posed facing to the viewer's left side. This beast measures in at a whopping 54.5" in length, 23" in girth, and has an estimated live weight of 32 lbs. This mount features terrific fins, painting, and overall taxidermy craftsmanship. 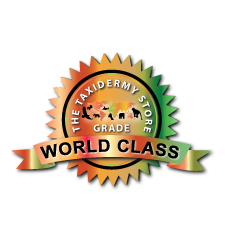 All of this combined helps this item earn our World Class™ overall quality rating. All applicable dimensions are included to help ensure this item will fit within your intended display space. - This is a reproduction mount, meaning it features no real animal parts. Muskellunge (or Muskie) are typically olive green in color, with shades of yellow or white along their bellies. They are speckled with dark green bars and spots along their entire bodies and have long slender underbites. “Muskies” are often fished for sport, and can be found throughout the northernmost parts of North America and into Canada. Musky grow to be large in size, up to lengths around 60 inches, making them one of the largest fish freshwater fish found in their region.